Peru Rail offers a Local Train service, which departs from the city of Cusco to the town of Aguas Calientes (Machu Picchu Pueblo); However, you should know that this train is not available for foreign tourists, and its operation is due to the number of people living around Machu Picchu and the train is the only means that allows them to mobilize; Besides the great increase of national visitors to the Inca City of Machu Picchu. Who can board the local train? The local train is exclusively for domestic tourists (Peruvians). People who hold a Foreigner’s Card with permanent residence in Peru can also access this benefit. National Passenger: People from any part of Peru. National Resident Passenger: People living in towns or cities near the town of Aguas Calientes. What is the price of the Local Train? The ticket of train ticket to Machu Picchu for people from any part of the country, is S/. 20.00 soles, round trip. The purchase of the local train ticket to Machu Picchu must be done by the traveler in a personal way; For this you must present your valid ID. Can I buy the ticket to Machu Picchu on the local train, online? Opening hours: 07:00 a.m. to 2:00 p.m. Address: Calle Cascaparo s / n, Cercado del Cusco. Opening hours: 08:00 a.m to 1:00 p.m. Address: Av. Pachacútec s / n District of Wanchaq, Cusco. Opening hours:: 04:30 hours to 18:30 hours. Address: Av. Ferrocarril s / n, Ollantaytambo, Sacred Valley, Cusco. Regardless of the season in which you buy the Train Ticket to Machu Picchu, you must board the train at the Ollantaytambo station, remember to arrive at the station 30 minutes before the time of boarding, if you arrive late you lose right on the ticket. Tren 71: part 05:07 hours and arrives 06:34 hours. Tren 73: part 12:58 hours and arrives 14:24 hours. Tren 51: part 21:00 hours and arrives 22:50 hours. Tren 72: part 08:53 hours and arrives 10:52 hours. Tren 74: part 14:55 hours and arrives 16:31 hours. Tren 76: part 21:30 hours and arrives 23:01 hours. These can vary according to the Peru Rail company, in charge of providing this rail transport service to Machu Picchu. It is a subsidized train, it currently has 05 passenger cars and some other freight cars and as we already mentioned, it is a train that can only be used by Peruvians, and the only way to approach it is to present the DNI of identity). In fact, the cars are not very comfortable, although the page of Peru Rail says otherwise; In addition, in this train it is allowed to transport passengers of foot and load in the passages. The established schedules can be modified by questions of weather, problems in the way or by others outside the company. 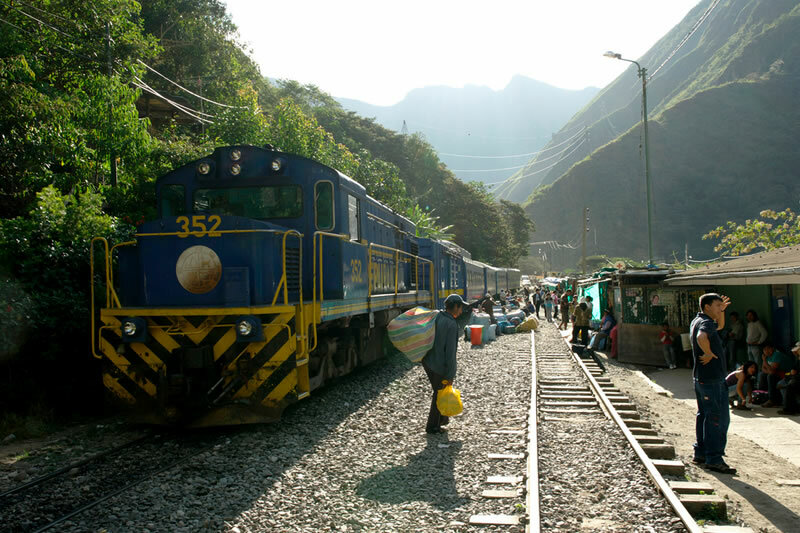 Peru Rail is the only company that offers the local train service. If you prefer another type of service, ask for trains like the Expedition or the Vistadome, or if you wish to travel on the Hiram Bingham (one of the most luxurious trains in the world).